This is my fingerstyle guitar arrangement of "Besame Mucho" by Consuelo Velázquez. The video is divided into two parts: the first I played the basic chords-melody of the song, as well as see them in the tablature. In the second part I added a bit of rhythm with percussive sounds. In the second part I improvised on the chords-melody, for this reason there is no guitar tablature. This is the goal that you must achieve, learn the basic chords and then try to add the rhythm. In this way you will get your personal interpretation of the song. 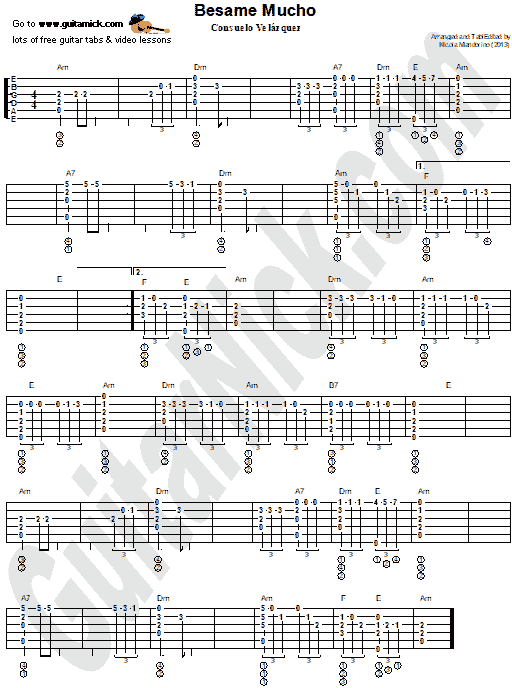 Learn to play it with free guitar tab, sheet music, chords and my video tutorial.